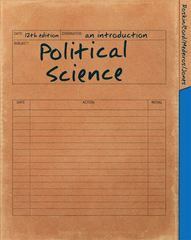 Political Science 12 Edition Balancing practical and theoretical knowledge, Political Science is a comprehensive and jargon-free introduction to the field’s basic concepts and themes. This bestselling brief book uses diverse real-world examples to show readers the value of avoiding simplifications in politics, the relevance of government, and the importance of participation. Written from Mike Roskin’s unique and engaging point-of-view, Political Science remains the best at providing the clear explanations, practical applications, and current examples that will welcome readers to a vital field of study.